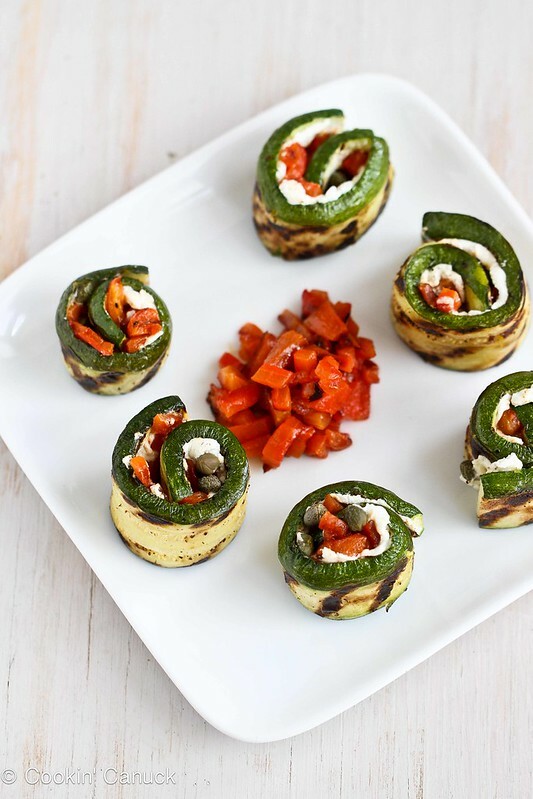 Grilled Zucchini Roll Recipe with Goat Cheese, Roasted Peppers & Capers is an easy and flavorful vegetarian appetizer. “No solicitors and no zucchini!” This is the sign that I need to plaster across my front door. You see, zucchini season isn’t far away and it’s only a matter of time before some mystery neighbor leaves a random bag of enormous green squash on our doorstep. This didn’t use to be a problem, but now we have our own vegetable garden and our plentiful bounty of zucchini. Whether the zucchini comes from our own backyard or elsewhere, I figured that I need to start churning out the recipes so we’re prepared for the season. 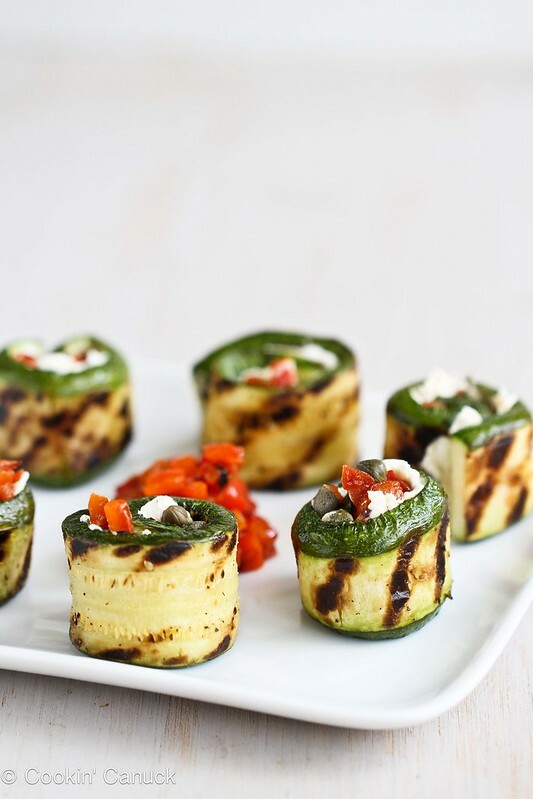 This recipe is inspired by one of the most popular recipes on my site, Grilled Zucchini Rolls with Herbed Goat Cheese & Olives. Simply brush the zucchini slices with olive, season with salt and pepper, and give them a quick turn on the grill. Once they have a chance to cool down, spread some softened goat cheese on each slice, sprinkle on some diced roasted peppers and capers and roll away. That’s it. Quite honestly, I could happily eat the whole plate of rolls for lunch. 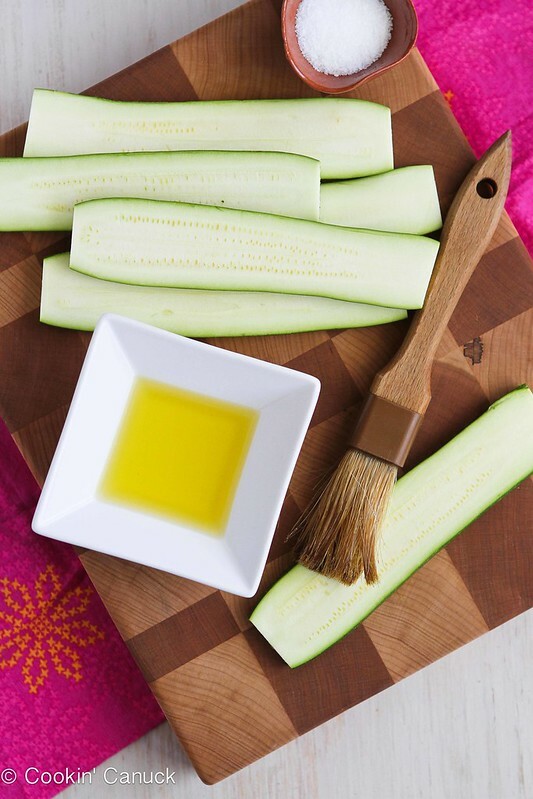 Brush both sides of the zucchini pieces with olive oil. Season well kosher salt and freshly ground black pepper. Lay the zucchini pieces on the grill. Cook until the zucchini is very tender, but not mushy, about 3 minutes per side, moving the pieces during cooking to ensure even browning. Remove the zucchini from the grill and set on a wire cooling rack. Spread about 1 teaspoon of goat cheese on each zucchini slice. Divide the red pepper and capers evenly amongst the zucchini. Slice a strip lengthwise from the zucchini to expose the inside of the vegetable. Discard or reserve for another use. Cut the 2 ends from the zucchini to make straight edges. Cut the zucchini lengthwise into ½-inch strips. These look awesome. The perfect summer meal! These look absolutely fabulous! Love this idea Dara!! I could spread goat cheese on a piece of wood and be happy! LOL. I hear you, Liz! So true about zucchini-giving. I have friends here that tell tales of people opening their car doors and slipping in bags of zucchini. Just pinned this recipe! I love everything about it! I love it: “squash squanderers!” These look awesome! I bet the goat cheese and capers give it a real tangy flavor. I’ve been eating a lot of zucchini with soy sauce lately, so I’ll have to try this. Super creative! Zucchini sauteed with soy sauce and a little chili-garlic sauce is the perfect combination! OK, 1: these look amazing and I’m pinning for dinner next week (before we get too tired of zucchini!!!) and 2: I’m sort of dying over the front door sign. It’s so true!!! Can’t wait to try. Thank you. Feel free to send all “squash squanderers” my way! These look healthy, light and delicious! I love this appetizer idea! So pretty and sounds fabulous! We are getting into zucchini season and I’m always amazed at how much just two plants can bring…so thanks for such a fun option. Why I can’t just do one plant is beyond me but I guess I think one would be lonely. So one thing that I do with some of the abundance is to grate it and freeze 2 cup portions. Thaw and use for zucchini bread this coming winter! A couple of years ago, I finally figured out the benefits of grating and freezing. We make uncountable loaves of zucchini bread during the holidays and the pre-grated zucchini is such a time-saver. These look so tasty, and absolutely gorgeous! I am a super nut for zucchini especially grilled. I’ll take that bag of zucchini any day! I put it in everything!! 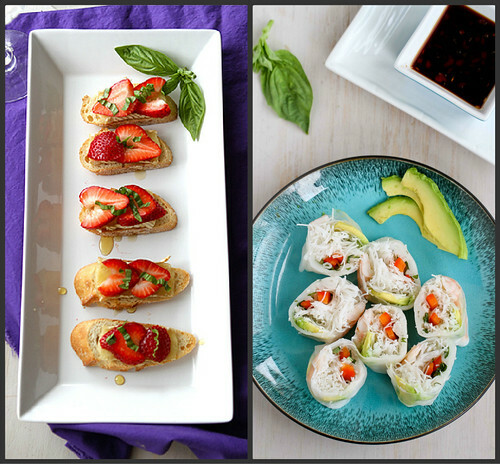 Thanks so much for including my cucumber rolls in this post! I really appreciate the referrals and I’m so glad to find your blog. It looks fantastic and I look forward to spending some time here. 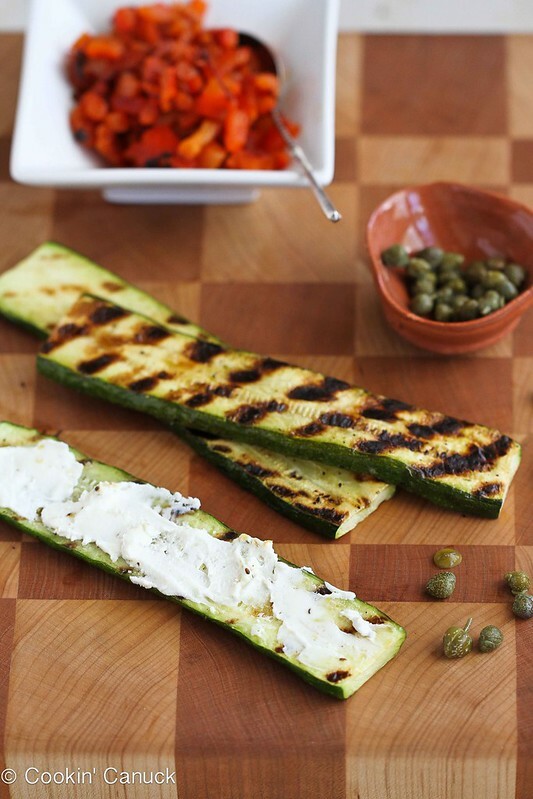 Grilled zucchini is one of my favorites and this recipe looks like one I’m going to try soon! Your recipe caught my eye and is now on my “must try” list. Maybe you could direct your neighbors towards me, I would love a bag of zucchini on my doorstep! I’d make a big batch of these yummy roll ups! Oh, Dara, I just got the first squash of summer from the CSA–and I’ve got goat cheese 3 ways (herbed, sun dried tomato-ed, and crumbled. I’m on it. Perfect, Kirsten! I hope you enjoy it. 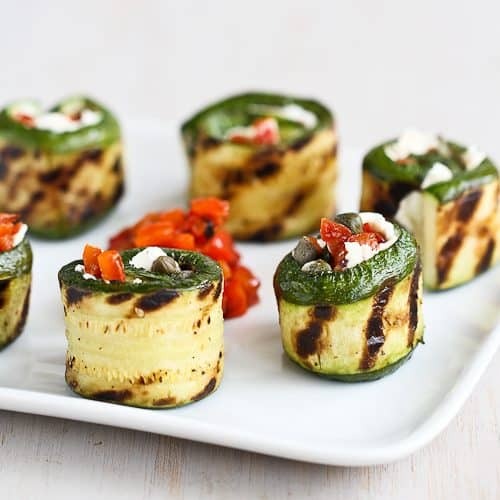 I love grilled zucchini and I could easily make a meal out of these rolls! G’day Dara, what a great dish and for entertaining too! Might have to put this on the list for my next dinner party, TRUE! How gorgeous Dara! You’re singing right to my goat cheese loving heart! I’ll take some of that zucchini on my doorstep!! 🙂 This is such a fun appetizer and a great way to use up that zucchini! I remember seeing these fab appetizer rolls in the Food TV magazne and I loved them! 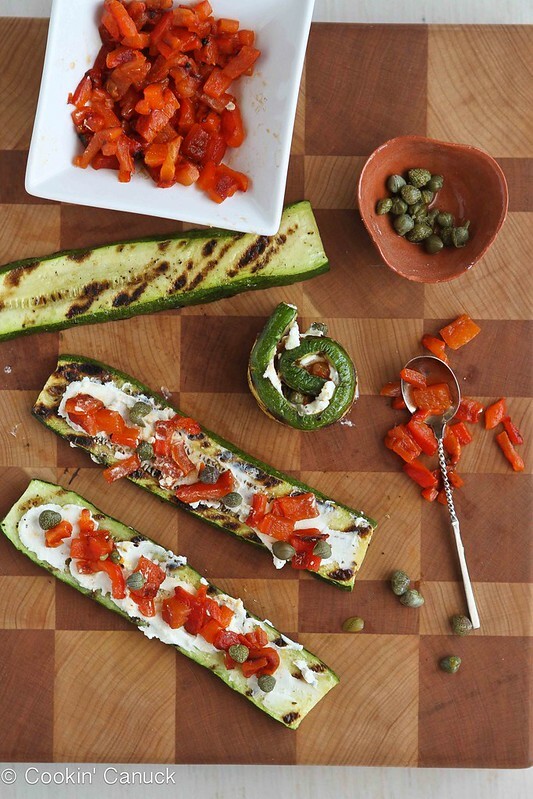 They had done grilled zuchinni with capers and tomatoes and some herbs. Either way I simply loved the idea. All the goodness rolled in to one. I am planning n slathering them with this amazing green goddess dressing/dip that I hve made. Tangy and salty and sweet. YUM! and I loved your clicks. mmm love Grilled Zucchini! What a great idea to stuff it!